On March 12, we reported that Nick Jonas flew to Hawaii, but we were unsure as to why the hunky singer was taking yet another tropical vacation. Thanks to Nick's Twitter account, we've uncovered that Nick is in Hawaii for work obligations — not some rest and relaxation. He's filming an episode of "Hawaii Five-0!" Back on the set of @HawaiiFive0CBS feels good to bring the character of Ian back to cause some trouble.. In December 2013, TVLine reported that Nick would return to the CBS drama for the show's season finale. 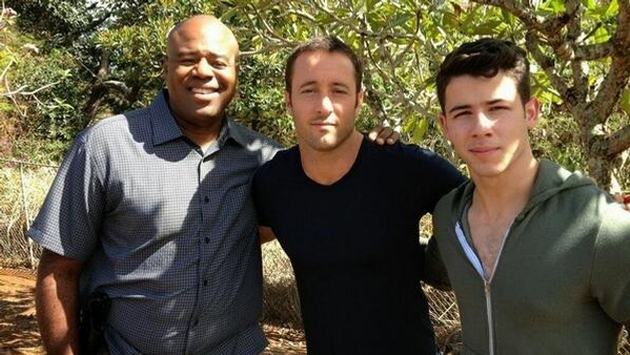 He first appeared in November as a computer hacker who evaded McGarrett & Co.
On March 13, Nick posted a photo from the set of "Hawaii Five-0." Furthermore, fans took snapshots with the actor, who wore a sleeveless t-shirt and showed off his bulging biceps. We're certainly excited to see Nick in more episodes of "Hawaii Five-0" and any reason to visit Hawaii is a good reason.